Homde 3-IN-1 Decorative Jewelry Box is coming. Unique design provide ample space to store all kinds of jewelry, such as rings, earrings, bracelets, necklaces, brooches and so on. Also, you can store your watches, eyeglasses and ties. Real glass enables you to see your beloved treasure. Metal hinge keeps lid from falling back. Watches, glasses and jewelry are not included. 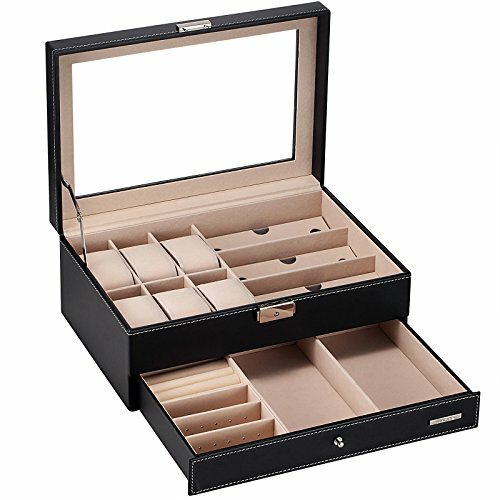 JEWELRY ORGANIZER & WATCH CASE & SUNGLASSES CASE: Unique design enable you to store your watches, eyeglasses, sunglasses and all kinds of jewellery. Tidy your countertop! DOUBLE LAYERS: In the first layer, there are 3 eyewear compartments and 6 watch slots with removable pillows. In the second layer, there is a jewelry tray to store rings, earrings, bracelets, necklaces, brooches, neckties and other jewel. REAL GLASS: Real glass lid keeps your watches and glasses from dust and offers you an open view of your displayed treasure. You can find your favorite watches and glasses in seconds. OUTSTANDING CRAFT: Made of premium Pu leather and soft velvet, this watch case is exquisite, gorgeous and durable. Lock in the top layer, adds security and keeps your kids away from your watches and glasses. WATCH CASE SIZE: 12.60″x 8.50″x 5.12″, ideal gift choice for Father's Day, Mother's Day, Thanksgiving Day, Valentine's Day, Christmas, birthday and wedding day. Watches, glasses and jewelry are not included. If you have any questions about this product by Homde, contact us by completing and submitting the form below. If you are looking for a specif part number, please include it with your message.